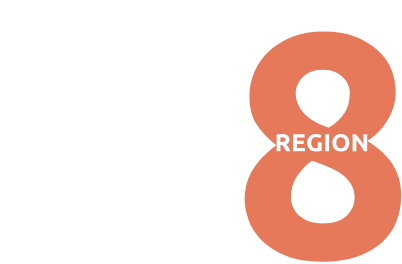 Region 8 of the Kennedy Center American College Theatre Festival is comprised of Arizona, Central and Southern California, Hawaii, Southern Nevada, Utah and Guam. Each year the KCACTF Region 8 Festival brings students and faculty together in mid February to see one another’s work and to share ideas. In addition to performances, there are a wide range of activities that in the past have included workshops and seminars on such topics as playwriting, auditioning, voice, movement, stage combat, theater for children, scene painting, scenery construction, and so on. There are sessions for beginning theater artist and the experienced faculty member. Students, faculty, and staff who bring productions to regional festivals are encouraged to attend the entire festival. All festival participants are urged to attend productions brought by their peers, participate as audience or auditioners in the Irene Ryan Acting Scholarship program, and to avail themselves of the full range of workshops, symposia, and exhibits that are part of each regional festival. Started in 1969 by Roger L. Stevens, the Kennedy Center’s founding chairman, the Kennedy Center American College Theater (KCACTF) is a national theater program involving 18,000 students from colleges and universities nationwide which has served as a catalyst in improving the quality of college theater in the United States. The KCACTF has grown into a network of more than 600 academic institutions throughout the country, where theater departments and student artists showcase their work and receive outside assessment by KCACTF respondents. The Kennedy Center American College Theater Festival (KCACTF) is a year-round program in eight geographic regions in the United States. Regional activities are coordinated through eight KCACTF regional chairs and eight KCACTF playwriting awards chairs. With funding and administrative support from the Kennedy Center, the regional chair coordinates with the Co-Managers of KCACTF all aspects of productions on the local and regional level and supervises regional-level KCACTF award competitions. The playwriting chair works with schools that have entered new and student-written plays by providing expertise in the development of new scripts–assessment specifically designed for a developing play–and by providing information on the numerous playwriting awards offered. If you wish to offer any corrections or additions to this history, please send them to kcactf8@gmail.com.